Lightly oil 2 x 18cm (2 x 7in) sandwich cake tins with a little rapeseed oil and line the bottom with greaseproof paper. Tip the flour, baking powder and sugar into a mixing bowl and combine. In a separate bowl, beat the eggs, add the yogurt, vanilla, melted butter, milk and oil and stir until smooth. Tip this into the dry mixture and gently fold with a large metal spoon until well combined. Divide the mixture between the tins and level the tops. Bake for 20 mins at (180C/160C fan/gas 4) until the cakes have risen and spring back when you gently press the top. Upturn one of the cakes onto a serving plate and spread the streamline strawberry jam over. 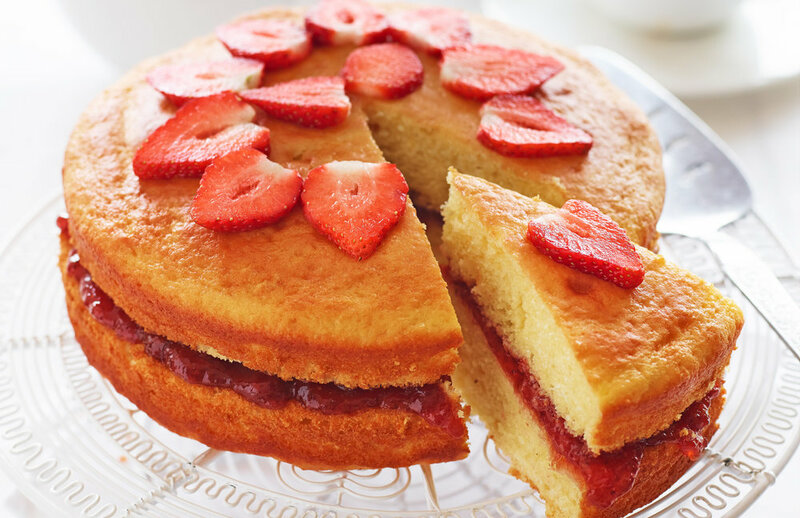 Gently place the other cake on top and decorate with slices of fresh strawberries. For more recipes grab the latest Yours. Packed full of fruit and using 30% less sugar than standard jams or marmalades, Streamline is the UK’s No1 reduced sugar jam and marmalade brand. Owners Streamline Foods Ltd have always valued good health. They are passionate about putting flavour first, working hard to perfect genuinely healthier products. For more information go to www.streamlinefoods.co.uk.